Rovers face Plymouth Argyle this weekend as they bid to cement sixth spot. 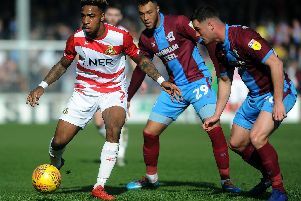 How does Doncaster Rovers’ impressive performance in League One match up with pre-season expectations? And, after a rollercoaster of a campaign, how will it all pan out? I had Rovers down as a dark horse for promotion this season based on a positive summer when they quickly got to grips with what Grant McCann was asking of them. But there is no doubt they have surpassed my expectations this term, simply by sticking in and around the top six for the entirety of the campaign. Runs without wins have been followed by strong ones to get them back on track. They are currently in the midst of one of those - and at the ideal time too. There has been a strong amount of confidence and belief within the group throughout the season that they are capable of winning promotion. And that has been backed up on the pitch with certain individuals enjoying stunning seasons. I am confident they will secure that sixth spot and from there I think they have an excellent chance in the play-offs, whomever they come up against. I imagine none of the other sides in the play-offs will fancy coming up against Rovers. That was my twitter post on August 3 last year - and what a pleasant surprise this season has been. It’s been great fun! Grant McCann has rolled the dice with his risk-taking brand of football and looks to set to land a sixth-place finish, exceeding most people’s expectations outside of the club but not those on the inside. He’s done that partly by creating something of a siege mentality in the camp. He thrives on proving people wrong and he’s fed off any negativity - including predictions in the national media that Rovers would be relegated - to motivate his players. I fancied Rovers for a top ten finish and a possible push towards the play-offs but the season has gone far better than I had hoped for. There was a question mark over the appointment of inexperienced boss Grant McCann, who had previously only overseen one full season from start to finish as a manager at Peterborough. But his positive approach, all out attacking policy and the brilliant loan signings of Herbie Kane and Mallik Wilks have turned Rovers into genuine promotion contenders and made McCann a manager other clubs will have an eye on. Rovers are in the top six. The job is not yet done. But just a couple more wins should see them safe and I don’t think anyone will fancy facing them in the play-offs. It’s been a feature of the season that every time they have had a slump in results they have hit back with three or four wins in a row and the bounce-back-ability factor will stand them in good stead when it comes to the play-offs. The two-leg semi-final will be tough but if Rovers can get to Wembley on the back of McCann’s no-fear approach there will be no stopping them as they seek to emulate the heroes of 2008 and achieve promotion glory. I’m an optimist and I genuinely thought Rovers were capable of a top six push. The manager has to take a lot of credit because he’s made some excellent additions to the squad - Kane. Wilks, Crawford, Downing. Left back was an issue last seasonbut Danny Andrew has given the team more balance. I’m confident we’ll stay in that sixth spot and I don’t think we’ve got anything to fear in the play-offs. Regardless of the outcome, this season has been an unmitigated success. A team made up of predominantly free transfers and previously unproven loanees has reached the FA Cup fifth round and had a full-blown tilt at the top six. A season of struggle - a mid-low table finish at best - was expected. For Rovers to be nowhere near the 12-team relegation malaise is testament to the progress made under a manager prematurely relieved of his previous post. We know all too well that it is a very easy division to slip out of! How does the season end? Rovers have earned their right to be in this position at this stage of the campaign due to their refreshingly cavalier approach. As individuals, they’ve been written off and as a team they’re ranked as underdogs – it’s a potent formula. Their cup exploits should serve as a warning to fellow promotion hopefuls, desperate for Championship football, that Rovers have nothing to lose and everything to gain. A few eyebrows were raised when Grant McCann was appointed but he has proven the doubters wrong. His brand of football has been a breath of fresh air and, on the whole, Rovers have been a joy to watch this season. Most people had us down for a mid-table finish but we are now in a fantastic position to clinch a play-off spot. I’d like to see us play Barnsley at Wembley but whatever happens we can be proud of our achievement. We have come a long way.